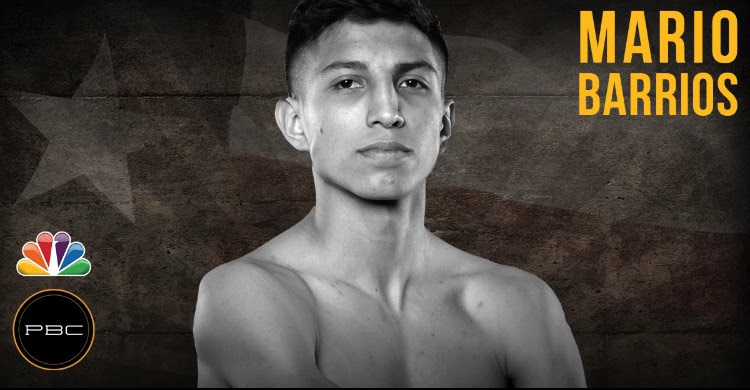 Unbeaten super lightweight Mario Barrios (20-0, 12 KOs) defeated Naim Nelson (13-4, 1 KO) via seventh round TKO in the main event of Premier Boxing Champions TOE-TO-TOE TUESDAYS on FS1 and BOXEO DE CAMPEONES on FOX Deportes from Sands Bethlehem Events Center in Bethlehem, Pa. The fast-rising star Barrios of San Antonio started the bout throwing multiple combinations to the head and body of Nelson of Philadelphia. He kept his distance and stayed patient, but did not get to showcase all of the tools in his arsenal as the fight took a turn in the third round when Nelson went to the canvas after hurting his left shoulder by throwing a hook. That was ruled a slip and he dropped to his knees again after throwing another punch, but after being examined by the ringside doctor, it was determined that Nelson could continue. Barrios was not deterred and continued to move forward, apply pressure and control the action into the fourth round. By the fifth, Nelson’s work rate dropped significantly, which Barrios took advantage of by battering the Philadelphia-native against the ropes. Throughout the sixth, Barrios stalked Nelson around the ring while Nelson tried to work through his apparent shoulder injury, countering with the right where he could. Barrios sent Nelson to the canvas with a hard left hand causing referee Gary Rosato to wave off the bout at 1:41 of the seventh round. The victory over Nelson marks Barrios’ fourth straight stoppage – all of which have taken place since he started working with renowned trainer Virgil Hunter. “I apologize to the fans of Pennsylvania as I wanted to put on a show tonight,” said Barrios. “After I caught him, he was trying to survive. He was moving around. I did not concentrate if he hurt his shoulder or not. In the co-feature, lightweights Thomas Velasquez (9-0, 5 KOs) of Philadelphia and Tyrome Jones (4-2, 1 KO) of South Bend, Ind. Tyrome Jones fought to a draw in a fast-paced six-round bout. Velasquez, who is mentored by former world champion Danny Garcia, started the fight going to Jones’ body and stuck with that plan throughout. As the fight wore on, Jones turned up the heat and listened to his corner who told him to stay busy and aggressive. Velasquez landed multiple straight left hands in the fourth that stung Jones, but the Indiana-native was able to counter with several straight lefts of his own. The sixth and final round showcased hard-fought action from both pugilists with Jones throwing several hard lefts with Velasquez countering with his own flurries of shots finishing the fight strong. In the end, the judges ruled the bout even 59-55 for each and 57-57. The opening bout saw light heavyweights Earl Newman (10-0-1, 7 KOs) of Brooklyn, NY and Paul Parker (8-2-1, 4 KOs) of Toledo, OH fight to an eight-round draw. Parker made it awkward for Newman in the first two rounds by starting out strong, moving forward, diving in and staying busy. However, Newman came out of the corner swinging in the third, throwing a left hook that forced Parker to tap the canvas with his glove although it was not ruled a knockdown by referee Benjy Esteves. Neman worked his right hand throughout the fourth round, ready to counter Parker’s shots. Newman drove Parker back with a left hook in the fifth and continued to put pressure on the Ohio-native throughout the round. The two-time New York Golden Gloves winner continued to press forward and walk down Parker in the later rounds, but was unable to finish strong enough to be victorious as the judges scored the bout 79-32 (Newman), 77-75 (Parker) and 76-76.